Today's manicure is a pink holographic glitter bomb! My personal favorite type of look to wear on my nails. I'm pink-obsessed, in other words. I first discovered Candy Lacquer through Peachy Polish who is one of my favorite nail bloggers at the moment. Candy Lacquer makes wonderfully glittery and fun polishes with something for everyone. Diamonds in the Sky is one of her newer polishes so I grabbed it up in her latest restock in mid-April. I'm so glad I did! 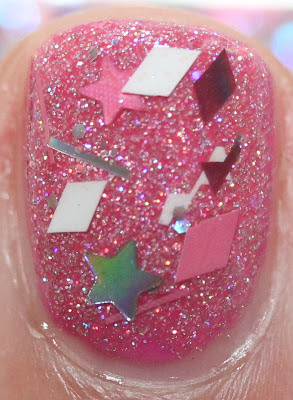 It includes a lovely mix of pink, white and silver glitters - ranging from stars to bars to diamonds. Since I wanted to go with the glitter-overload look I decided to layer it over a pink holographic glitter polish. Pink pink pink! There is so much pink and I love it so much! All pictures show 1 coat of Candy Lacquer Diamonds in the Sky over 1 coat of Kleancolor Pink Holo over 1 coat of Sally Hansen Wild Watermelon and top coat.